This major revelation is what guided Nolan Wilson Goff, a busy commercial director in Los Angeles, to make his first short narrative film since his final year of film school. 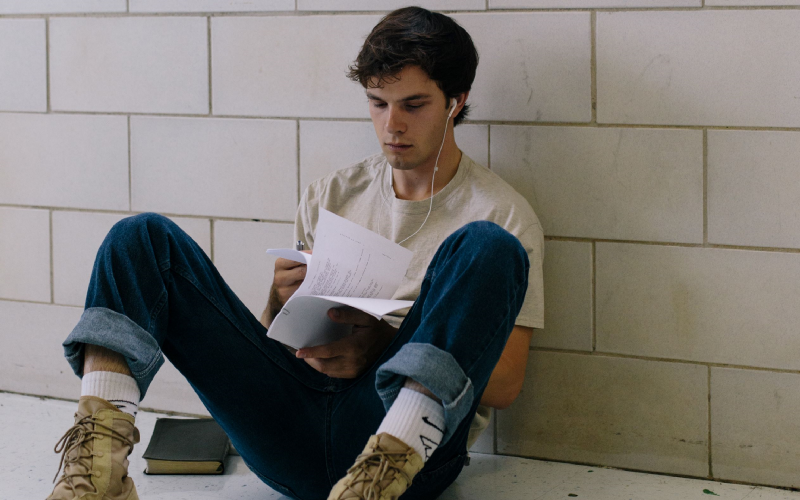 It’d been a long time since Goff had had the time and opportunity to make something as personal as Nobody Knows, the story of a quiet high school boy in an unassuming Texas town. In fact, many of the locations in the film are places pivotal to his childhood and coming-of-age. One could say Nobody Knows was like going full circle for him; except we know his career as a film director is far from complete. Nolan talks to Miniflix about making his first short film since film school, why music videos and commercials aren’t treated equally in the business and how two actors changed his story for the better without a single line of dialogue. Miniflix Interviewer: What’s one positive takeaway lesson from your first attempt at directing a short, and what’s one negative takeaway (or something you’ll never do again)? Nolan Wilson Goff: When you’re a young filmmaker, you tend to tell stories that are really emulating or imitating other filmmakers, telling the stories that they’ve told. The thing I struggled with early on was not learning yet to tell my own story, not having my own point of view coming through at an earlier stage. It’s something I wished I’d gotten to more quickly. The positive takeaway is that you’re a little bit more fearless at first. You’re not thinking about how this project could lead you to getting represented or lead to you directing a huge film. You’re not putting an expectation on it. The stakes are a lot smaller, and there’s room for failure and to screw up. Miniflix: How did you find yourself transitioning out of being a film school director to becoming a director-for-hire? Was it hard? Was it easy? Nolan: I had this certain perception that I’d graduate, and that I’d go make music videos, that would lead to commercial work, that would lead to features. It made sense at the time, because I felt like that the stakes would get higher each time at a natural progression. So after I’d gotten an opportunity to direct a couple music videos, I thought that that was going to be a thing that continued and that would sustain itself. And it didn’t. It just completely dried up. I definitely spent some years there not being productive, not writing…but I was fortunate enough to get this opportunity directing commercials and brand content at Matte Black, a marketing agency and production company in Los Angeles. That gave me really consistent opportunities to direct. But that wasn’t an immediate thing. It took several years of working on other things at the agency for the directing opportunities to gain steam. Ultimately, music videos and commercials and features all have their own glass ceiling. They’re all completely different. It’s not so mathematical or scientific. A lot of providence has to be at play. I know music video directors who direct some of the biggest music videos you can possibly imagine, and they can’t get any commercial work. As someone who directs commercials now, the few times I’ve pitched music videos the last few years — even ones with really small budgets — I couldn’t get those opportunities because I wasn’t a “music video director”. They only saw me as a commercial director. So just because you’ve directed a commercial with a six figure budget, it doesn’t mean the powers that be will have the confidence in you to do a $10,000 music video. Pretty crazy. M: What’s one major difference between working on a film school set and working on a professional set? N: Whenever you’re making a personal project, I think the feeling is always the same, no matter if you’re making them in film school or making them afterwards. At least that was my experience while making two student films and then Nobody Knows later on. The biggest difference of being on a larger, professional set is just the outside voices. There’s a lot of cooks in the kitchen, so as a director your job is really more about keeping the whole train on the track. Especially with all of those outside influences. You know, you’ve got agencies that want to see the creative come through in a certain way. You’ve got clients who have their own unique aims and ambitions for the creative. You’re managing all of these relationships and all of these expectations. And hopefully, amidst all that, you’re still creating the thing you set out to make. But it’s those outside voices that make it more of a professional setting and less of a creative setting. M: When it comes to your commercial projects, is there a script, and how much of a pre-ordained outline do you get to play around with? N: In my situation, a client comes to us with a brief, usually highlighting a product or service, and then we go to work making creative out of that. The treatments look different every time. Sometimes, if it’s more of a tonal, montage-heavy piece, the treatment might not be as specific. It will be about looks and feels. If it’s something more specific, with a really specific goal and key message, that’s something I’ll need to storyboard out for the a client, so they can see the full story. The creative is my contract with them. If they’ve signed off on the creative before the production, it’s much easier to avoid the client deviating from that plan on set. You can always refer back to what they approved. It’s an interesting thing, because sometimes there’s a script, but usually you see that most often in a 30 second tv spot. In the digital world, projects become a lot more fluid. M: What were some of your visual influences in Nobody Knows? What was behind the ultimate decision to go with a more boxy aspect ratio? N: What was really important to me was that I was telling a story about the place. First and foremost, it was an opportunity to go home and tell a story back home. So I really wanted the place and setting to come through. The landscape itself was the thing that forged Ross. It’s the environment, setting and landscape of his upbringing that crafts his worldview and that makes it difficult to be honest about what happened. The goal behind every frame was to be constantly relating all the characters to the landscape, and seeing that relationship between the two. So a lot of our references were photographs, landscape photography, landscape paintings. Definitely more observational cinema. Regarding the aspect ratio. Sean [Conte], the cinematographer got the idea from us looking at so many photographs as our references. We’d talked a lot about how we wanted every shot to look like a moving photograph in a way. So the classic 35mm photograph aspect ratio is 3:2. It’s a little bit taller, though not as tall as the 4:3. It gives you more on the horizontal axis, but it was one of those ideas that we had and that just felt right. It created very interesting blocking for the actors and forced me to look at the frame in new ways. M: Nobody Knows seems like the first out of the three short films of yours to give us a real stylistic or aesthetic closure to the film, rather than a narrative sense of closure. Why would you say that is? Is it merely the progression or maturity of your abilities as a director, or just serving the needs of that story? N: I think this has a been a natural evolution for me. I’ve been slowly moving in this direction: being more reliant on visuals and tone. Something like pure cinema in a way, rather than being reliant on lots of dialogue….that’s not to say there’s not dialogue in Nobody Knows, but it’s definitely more parsed down. In watching many short films over the years, and figuring out what works and what doesn’t work… it seems that the short films that don’t work tell too much story and try to get us to some really significant resolution by the end. The truth is that you just haven’t spent that much time with the characters in such a short medium. All you’re really able to do is to indicate what someone’s supposed to feel and try to guide them to that feeling….because it’s just a 12 or 15 minute film. It’s all you can do. It’s literally a problem of time. Nobody Knows might have a three-act structure, but I do try to pick a specific window of time and stay within that. You don’t get to know about Ross’ relationship with his mother beforehand, and you don’t know what happens after that scene on the porch… it becomes emotionally resonant because I’m not trying to point you to a specific answer, but rather, I come in, get out and leave you to fill the blanks. Actress Abby Wathen and Nolan Goff preparing for a scene. M: How many days did you get to shoot this project? What camera and lenses did you use? N: We shot over four days. We did about five or six days of preparation, where the key department heads came down to Texas and we worked together on ironing out a lot of things. Then four days of actual production. We shot on the Arri Alexa XT with Canon K35 lenses. I really wanted to tell a modern Texas story. So a story that has guys walking around with cowboy boots, but they’re also on their cellphones — that kind of story. Shooting digitally and then using vintage lenses would give it a certain kind of collage of time periods. There was an historical patina that the lenses gave us. M: Was there a particularly difficult shot to get? If so, how did you push through it or solve it? N: We were filming the wake scene in the church, and a thunderstorm comes in, forcing us to pull the lights inside. We ended up losing a lot of time because of that. Because we lost so much time, we were heading outside to film in the back of this old Bronco. It’s a scene with Ross and his mom sitting in the car, with his mom getting onto him for walking out of the service. Originally we’d plan to shoot the whole car scene with more traditional coverage, but we had lost so much time. The sun was going down and we only had Abby [Wathen] for that day, so we had to actually go shoot the film’s final scene even after the car scene. We were truly up against the wall. Rather than traditional coverage for the car scene…we realized that if we put the camera in the back of the car, we could just cover both actors at the same time. We can have Abby walk up in the frame, have her climb in and have this conversation take place. Actor Tommy O’Brien looks over the script for “Nobody Knows”. But the most beautiful thing about it — and I can take no credit for this — was how present Abby and Tommy [O’Brien] were in the moment. In the scene, things get heated for a moment, then the argument calms down and Abby reaches out and embraces Tommy’s arm. And then Tommy, a few seconds later, takes her hand. I personally think it made the scene. Neither gesture was in the script. It’s not something I asked them to do. Honestly, the scene would have felt really cold from that point of view had that warmth not been brought into it. That moment ends up paying dividends in Ross’s ability to get a place where he can be honest with his mom about what happened just a few scenes later. The moment between them did a lot of legwork there, so I’m extremely thankful of actors who could be so present. M: What’s your favorite short film and why? N: There’s a film by the Safdie Brothers that’s called The Black Balloon. I saw it at Sundance and was really struck by the way they use the short film medium to toy with your expectations of what a film could be. The black balloon floats around New York City and brings us to all these different interactions with all these different people. The balloon is the protagonist in a way. Yet, it doesn’t say anything. It’s not personified in any way. But I always thought it was really interesting that this object could be the thing that carried us through the story. You can see Nobody Knows, along with more of Nolan’s commercial work, at http://www.nolanwgoff.com/.